In this project I worked together with Judith Vossen. We asked the children of an asylum seeker’s centre in Amsterdam and the residents of the surrounding area the question: “What is the most precious thing you have had to leave behind?” Their answers formed the starting point for this video project. Almost everybody has had to part with something once by moving to another house, neighbourhood, city or country, that is, having to leave cherished things behind. It was shown through 3 video beamer projections. 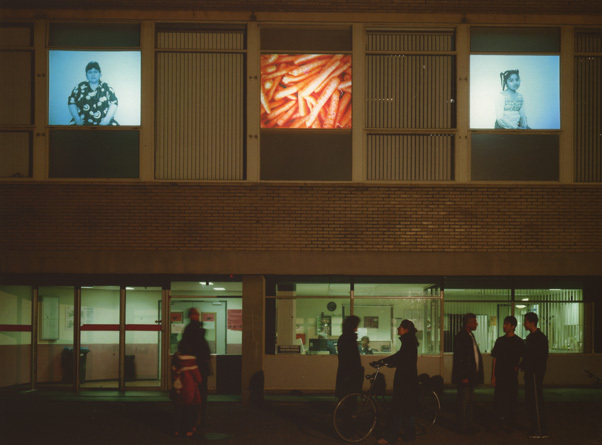 These projections could be viewed and listened to from the outside. The left projection showed the memories. The right projection showed the interpretations. The children spoke in their native language, the grown-ups in Dutch. The screen in the middle showed associative images ensuing from the memories.